Employee experience matters. Our platform can help. "Bonfyre” is a great social networking app that allows you to share your photos and videos, as well as group chat with what you’re doing and who you’re doing it with. It’s simply picture messaging that ties in with how you live your life: one moment at a time. My only gripe is with some of the aesthetics. I feel the news feed is hard to read and decipher who made each post and what text pertains to each post/photo. Its also not easy to go to the profile of the person who post a photo. "Meet employees where they are at to create conversation and connectivity"
I love that the app is mobile first and super easy for busy employees to participate and consume content. Everything about the platform (the layout, colors, buttons, and even the content that the client success team helps shape) is fun and doesn't "feel" like work. I also like that most of the configuration is in the hands of the admin and can be done from a mobile device. My favorite features would probably have to be the recognition badges and surveys. Just waiting for another form of authentication besides email since many of our employees don't access their email or don't have email...it's in development! It's all about engaging employees with content! If its not meaningful, then employees will not adopt or come back. Bonfyre is helping us move from communication to conversation in times of change, to create more transparency and improve relationships between senior leadership and employees, between departments, and even within departments. We are also solving the problem of communication not reaching all employees due to ineffective methods (email, huddles). Bonfyre allows us to reach all employees regardless of shift, location, schedule, etc. Employees can choose to actively participate or just be a fly on the wall consuming the content which has even led to these introverted employees joining the conversation eventually. "Great event or social app "
Not much. All feedback is taken pretty seriously at Bonfyre and they are already implementing some suggestions given. The one thing we are still looking for is the ability to pre-schedule push notifications. Customer service is excellent - Justin Padinske is a HUGE help. Easy to use, looks updated. Would 100% use. Their customer service is incredible and they work super fast. "Work safe and appropriate social media platform. " a safe friendly way to engagement co-workers, without dealing with the toxicity that can come with facebook or twitter. the Bonyre team is amazing to work, results turned around within a day, constant follow-up, they really ensure our happiness and want this to work for us! Not much. I wish I could post gifs or things along those lines. Employee engagement is extremely high for us now. With typical endeavors, our engagement is 30-40% with Bonfyre we have engagement above 70%! "Easy to Use - Effective for Employee Engagement"
The app is easy to use and has so many useful functions. I keep stumbling across new tools I can use. Sometimes the app doesn't always show notifications, so if I don't actively check each of my groups, I might miss something. Employee engagement and communication. We have several employees that do not have work email. This is a fast way to communicate information to them without individually calling all of our employees or relying on posters or word of mouth. We also use the app to recognize employees and share information about ourselves to make each other more approachable. "Easy & fun to gather a bunch of people"
I like that you can post videos/pictures in there for everyone to see. You can use this for work purposes or for personal ones. It's a nice way to group together activities. Not much that I can think of. The interface could be better, its a little bland. Whenever we have team building outings/activities, its a way to sync everything and notify everyone involved of what we're doing, pictures, directions etc. "Fun and creative way to interact and communicate with your teams! " It’s intuative, easy to administer and has great analytics to track usage, adoption and engagement. The team supporting the app is responsive, creative, agile, and willing to try new solutions to meet your needs. The notification/news feed seems backwards from other social platforms. Building internal networks and increasing communication with and among our team members, in a less formal way. "Experience with Bonfyre and its privileges"
Bonfyre is more of an employee communication, engagement and healthier work culture tool. it helps built better inter personal relationships. support from the Bonfyre team is great - accurate and fast. They handle our last minute questions and asks without hesitation. 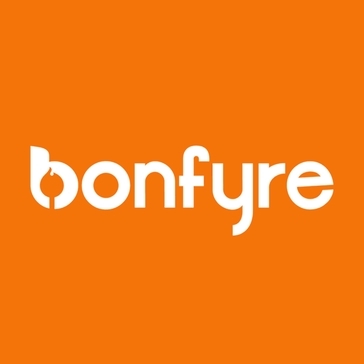 "Great tool to help create a culture of community and connectiveness at work"
* We monitor all Bonfyre reviews to prevent fraudulent reviews and keep review quality high. We do not post reviews by company employees or direct competitors. Validated reviews require the user to submit a screenshot of the product containing their user ID, in order to verify a user is an actual user of the product. Hi there! Are you looking to implement a solution like Bonfyre?